In a large bowl, combine the first seven ingredients. Cut a thin slice off the top of bread. Hollow out the bottom half, leaving a 1/2-in. shell. Cut removed bread into 1-in. cubes. Place cubes on an ungreased baking sheet. Broil 6 in. from the heat for 2-3 minutes or until golden, stirring once. Place bread shell on an ungreased baking sheet. 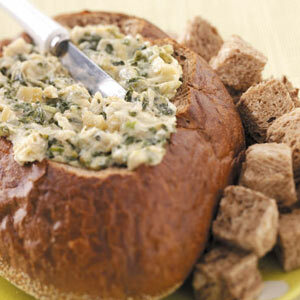 Spoon dip into bread shell. Bake, uncovered, at 350° for 20-25 minutes or until heated through.